LEAF (Local Enhancement and Appreciation of Forests), an award-winning environmental non-profit program whose Backyard Tree Planting program provides subsidized tree planting for Toronto residents, wants people to know that this simple act provides one of the most effective ways Toronto homeowners can contribute to mitigating the effects of climate change on an individual level. 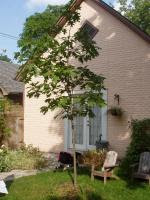 Visit http://www.leaftoronto.org/backyard-tree-planting-program or call 416 413 9244 to inquire about the Backyard Tree Planting program today! LEAF staff will be happy to assist you with details on how you can take part in the program. Yard consultations start in March and continue through to the end of November. Planting happens in spring and fall. Maria Doyle and Frida the Dog have started a Sam Smith Park Dog Walkers’ blog. They want an official off-leash area on the filtration plant lands. For more information, go to ……. TATSU's, the bakery and coffee shop on Lakeshore, one block west of Kipling on the north side, is a great place to go for breakfast at the weekend. They have entertainment from 11 a.m. to 1.oo p.m on both days featuring jazz from Humber students, poetry readings and presenting authors. At the moment, a local artist, Megan Williams, has her watercolours of Sam Smith Park displayed on the walls. Check it out. It has been a couple of years since the badly damaged interpretive signage at Sam Smith Park was finally removed. A group of students from Sir Sandford Flemming College have been working on new signs. This is an opportunity for community members to provide their feedback on the students’ work. 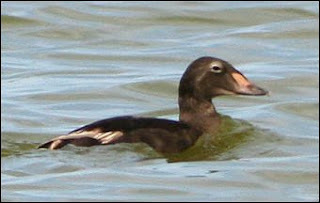 We made a quick visit to Colonel Samuel Smith Park today to see if we could relocate the young male King Eider reported yesterday. We re-found in quite easily just off the rock point south-west of the eastern most bay. It was quite close and was actively feeding on what appeared to be mussels. 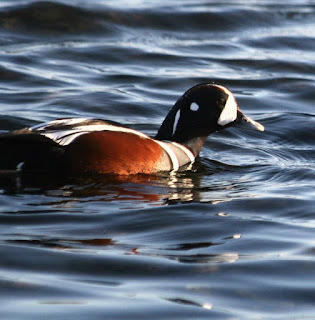 As we were leaving we also found a first year male Harlequin Duck in the next bay south-west of here near the point. 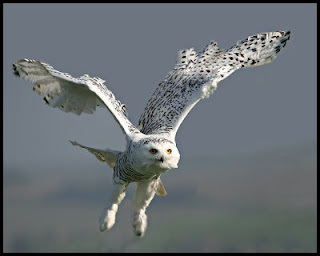 As luck seemed to be on our side we checked the marina and re-found the Snowy Owl which we had missed on several earlier occasions. The parks people clean out all the opportunistic (what we call disturbance-adapted) plants growing along the margins of the inlet in Col. Smith Park - this is so there can be better viewing access to the water. As a result, the beavers have to come out of the water and eat young trees. This makes the parks people angry because they are trying to grow the trees, so they begin thinking about beaver removal. During a brief warm spell in December, I think, I photographed a beaver chowing down on some cattails. He was in the water, feeling nice and calm, and warm (getting out of the water would have chilled him), so he let me get within about 5 metres. Now, he'll come out of the water to eat if he has to, but in the water, he's safe from humans and dogs, so all we have to do so people can see a beaver up close is let some natural shoreline vegetation exist.